This observation shows the edge of a dark dune field on the floor of Proctor Crater, a 150-kilometer diameter crater in the Southern highlands of Mars. The dark dunes are composed of basaltic sand that has collected on the bottom of the crater. Dark dune slip faces (the steeper sides of the dunes) are located on the east side of the dunes and are believed to have formed in response to fall and winter westerly winds caused by geostrophic forces (winds balanced by Coriolis and pressure gradient forces). 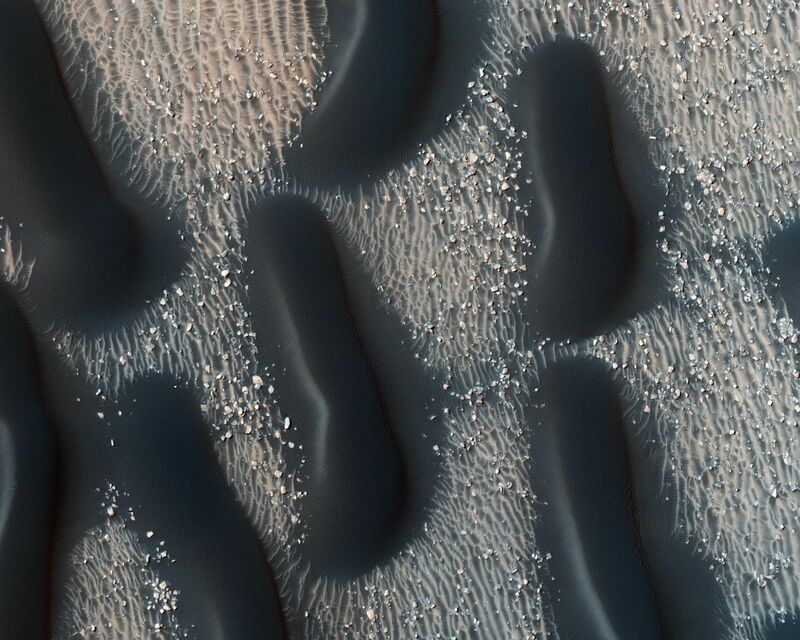 Superimposed on their surface are smaller secondary dunes that are commonly seen on terrestrial dunes of this size. 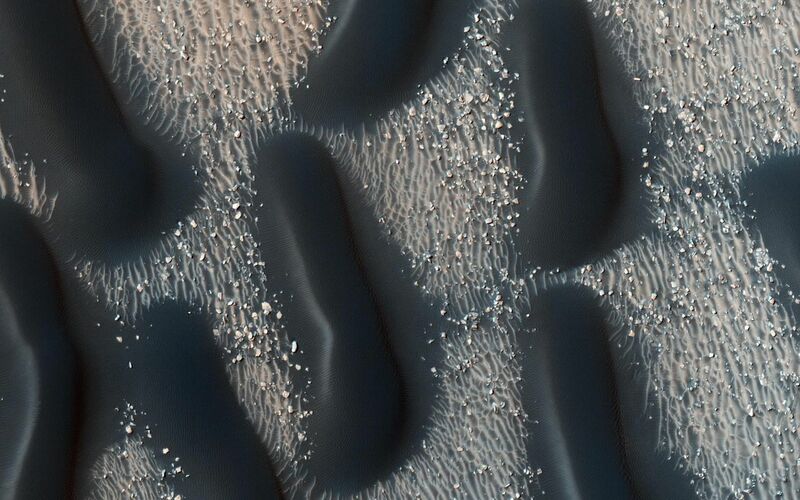 Many smaller and brighter bed forms, most likely small dunes or granule ripples, cover the substrate between the larger dark dunes as well as most of the floor of Proctor Crater. The dark dunes overlie the small bright bedforms indicating that they formed more recently. 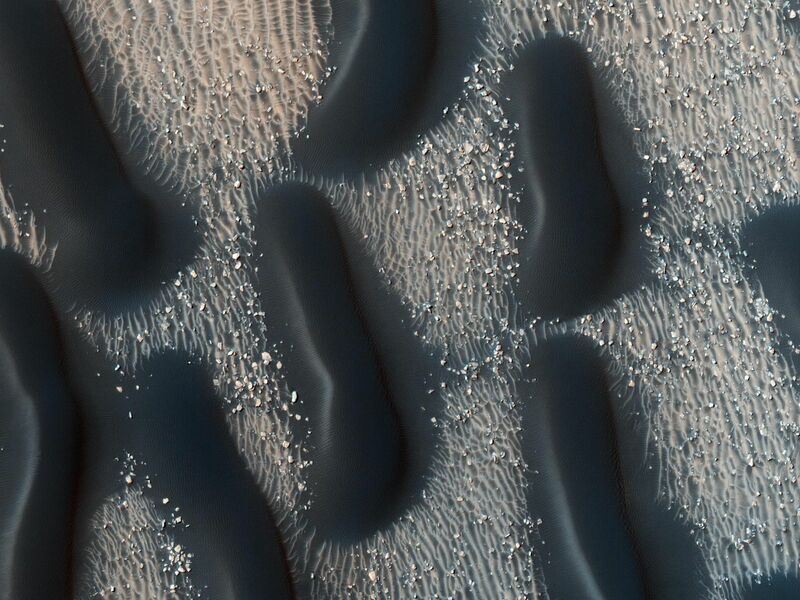 In several areas, however, the dark dunes appear to influence the orientation of the small bright dunes, possibly by wind flowing around the larger ones, suggesting that both dark and bright bedforms are coeval. The dunes in Proctor Crater may be active today, moving in response to Martian winds.